Historically, Helix products have used copy protection to ensure that only the licensed number of copies are being run. Helix’s licensing agreement allows you to install Helix products on as many machines as you wish, but you can only run as many copies concurrently (simultaneously) as your license permits. Helix products are licensed by “concurrent access.” Concurrent access (or CA) is defined as the number of users that can use the product at one time. For Helix Server, CA means the number of Helix Clients that are permitted to access that server at the same time, regardless of the physical location of the Client devices. For Helix RADE and Helix Engine, CA means the number of instances of a Helix application registered using the same serial number, running at the same time, regardless of the physical location of the devices used. 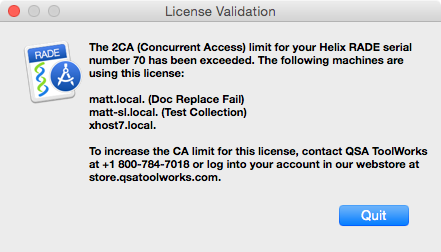 Exceeding the CA license of a Helix application results in a dialog box that informs the user of the issue and provides an option to quit. The serial number of the Helix product and the licensed CA limit are displayed in the first paragraph. The machine name of each running copy is displayed. For each copy that has collection open, the name of the collection is displayed in parenthesis after the machine name. Instructions on how to increase the CA limit are given. Wait until other copies of this serial number have quit, at which time the dialog will close automatically, allowing the user to resume work. Increase the CA limit of the serial number being used by purchasing an appropriate license. If a second copy of Helix Server is needed, each workstation must be registered using a unique serial number. Note: To run two or more copies of Helix Server on a single workstation, each instance must be run under a different macOS user. Register each workstation using a unique serial number. In all cases, installing an updated CA license is done by choosing Registration… from the Helix <app> menu and pasting (or typing) in the new key. See this technote for information on the registration process.